Well it’s been awhile since I’ve had the time to do anything pertaining to golf. My life has been pretty crazy the past few months. Things have settled down now and I can finally think about golf again, which is always exciting, and I have some good news and some bad news. The good news is that I was offered and started a great job at a great company. The bad news is that I’m no longer an independent contractor, so I don’t have unlimited vacation. I also already have a week long family vacation planned in October, so I need to accrue vacation time for that. Therefore my Top 100 quest is going to take a little hiatus this season, for the most part, since getting on these courses is hard enough as it is, let alone not having to take time off work to do so. I am planning on going down to Long Island in June though to play Bethpage Black and officially knock that one off the list again, since I can just shoot down there on a weekend. Other than that, there’s not too much I’ll be able to do. I know there’s several clubs that I can get on this summer, but I don’t want to bother them with possibly not being able to go when they’re available to host me. Now that I have the time I’ll finally be able to write up my reports on Oak Hill and Dallas National. They were both just phenomenal experiences. Oak Hill is almost done, so I’ll be posting that within a day or two. Look out for those and I’ll let you know, as soon as I do, when I’ll be going to Bethpage and any other courses I’ll be visiting this year. The weather is finally turning up here and I can’t wait to get out on the course! Well, I finally got around to finishing this a month later. I originally planned to play Longaberger GC when I was out in Columbus. 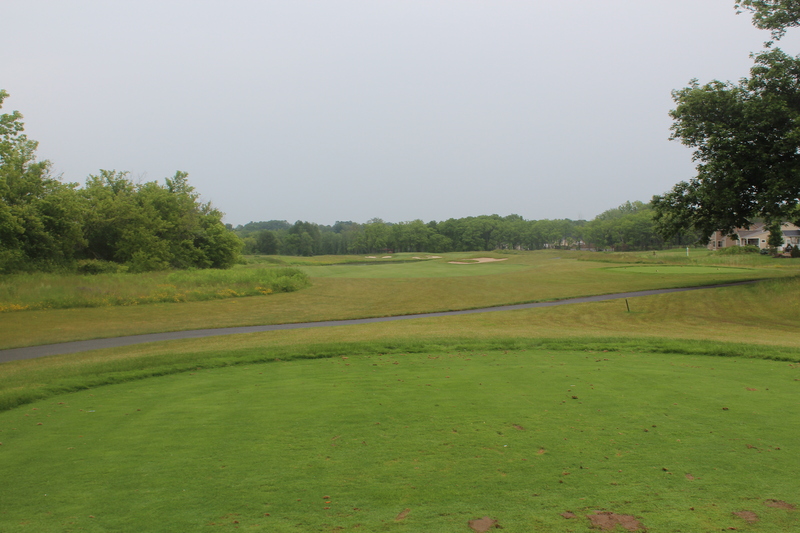 Unfortunately, weather didn’t cooperate on the day that I had time to play. However, I did get a chance to play at Timber Banks, the day before my flight out, with my buddy Kris, who lives in Syracuse. The weather wasn’t great and we got drizzled on a bit, but nothing too bad. 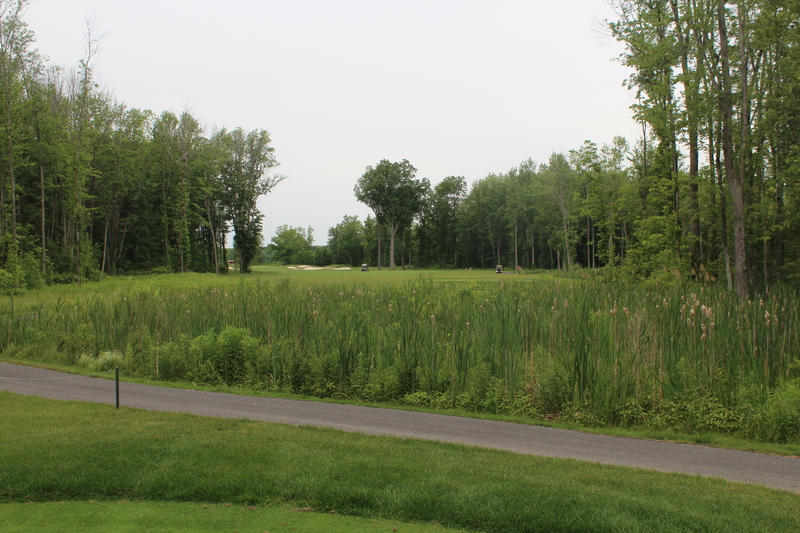 The course is predominantly set on wetlands, with a few tree lined holes. 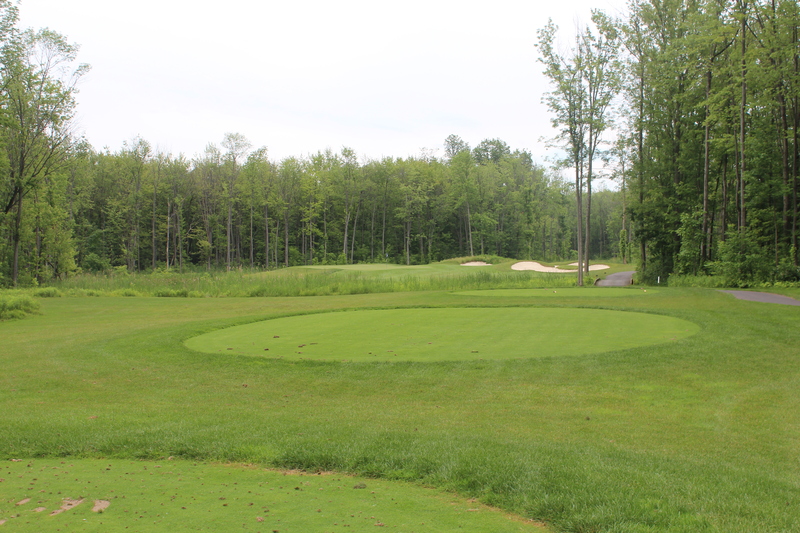 The club opened in 2010 and is the only Jack Nicklaus designed course in upstate New York. 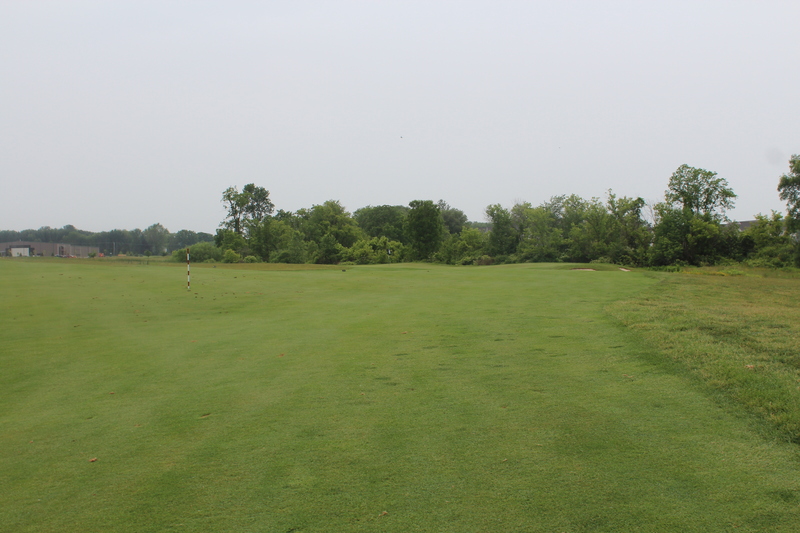 We played from the White tees, which measure up to 6202 yards. It’s a par 72 with a course/slope rating of 70.5/133. 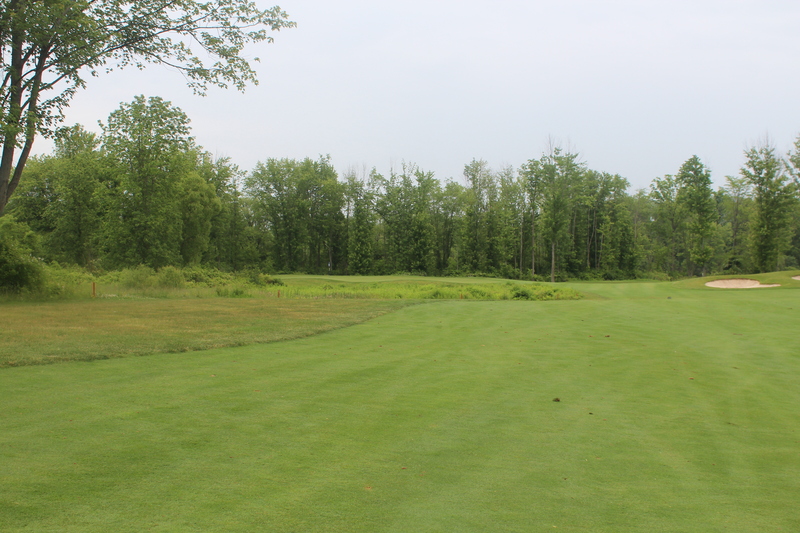 Timber Banks starts off with a very easy, short par 4, which is always nice. Just take whatever club will get you to your preferred layup distance and put it down the middle. Below is the view from the tee. Below is the approach shot. I hit a 6 iron off the tee, didn’t catch it cleanly and still only had a 9 iron in. I’m going to mention this only because it rarely happens to me. I put my approach just on to the front of the green and sank the putt for a birdie on the first hole. Great way to start the round! 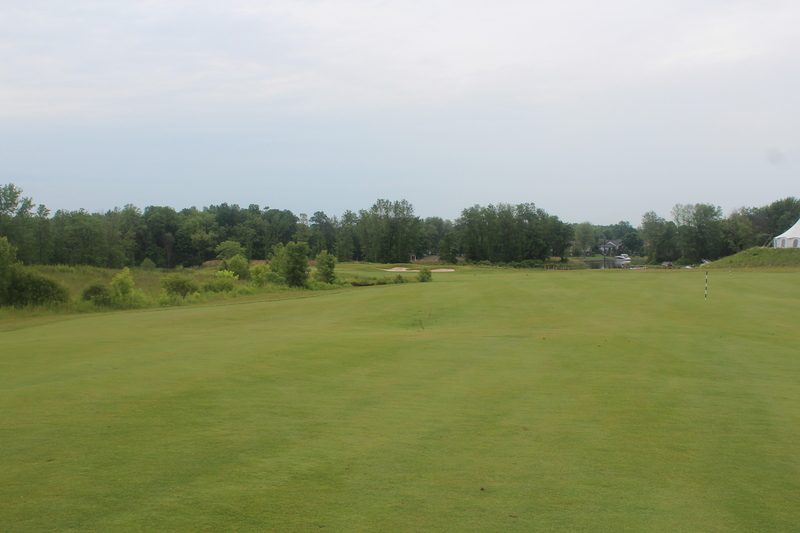 The 2nd hole is a dogleg left, relatively short par 5 which is reachable for a lot of players. The tee shot is fairly straightforward. 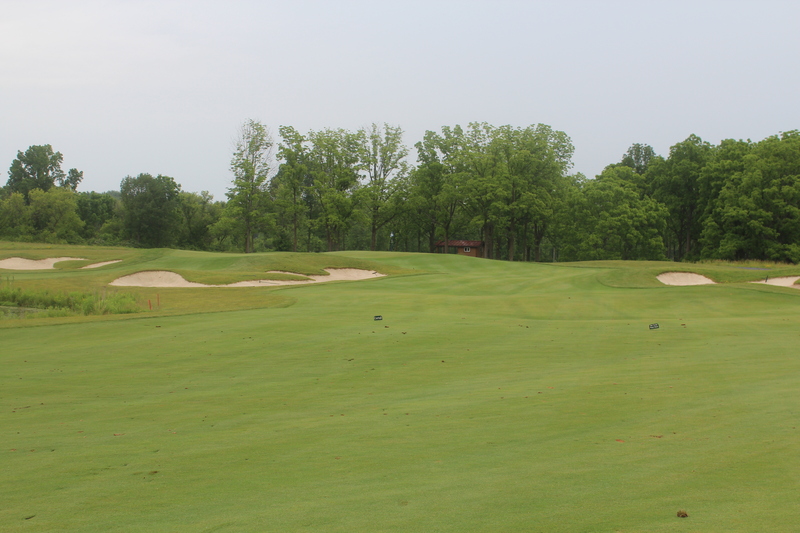 You just need to avoid the bunker complex on the left and you’ll be in good shape. I doubt very many people can carry them, but if you do, you’ll have a short second shot. The short carry over the marsh, as you’ll see, is a theme here and is never really an issue. For the second shot, however, the marsh does come into play. You must either decide to carry it or layup short, about 110 yards out. I decided to go for it, feeling hot off my birdie on 1, and put it just on the right edge of the big bunker in front of the green. Below is a shot of what the layup shot would look like, just short of the marsh. You can see the big bunker in front, guarding shots that come short. It shouldn’t be an issue if you lay up, but if you go for it, make sure you carry it or actually hit into it. I was just on the edge and had a severe ball above my feet lie, which ruined any legitimate birdie opportunity. 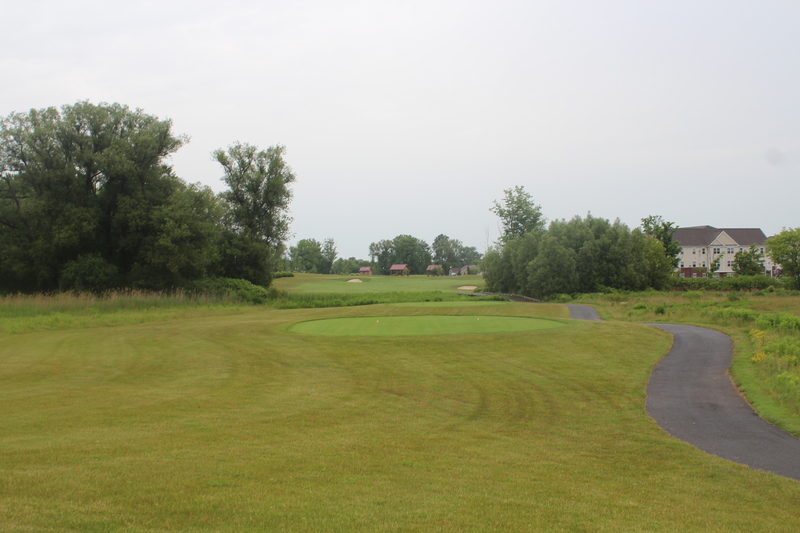 The third hole is a short, dogleg right, par 4. I love these kind of holes, where accuracy is much more important than distance. 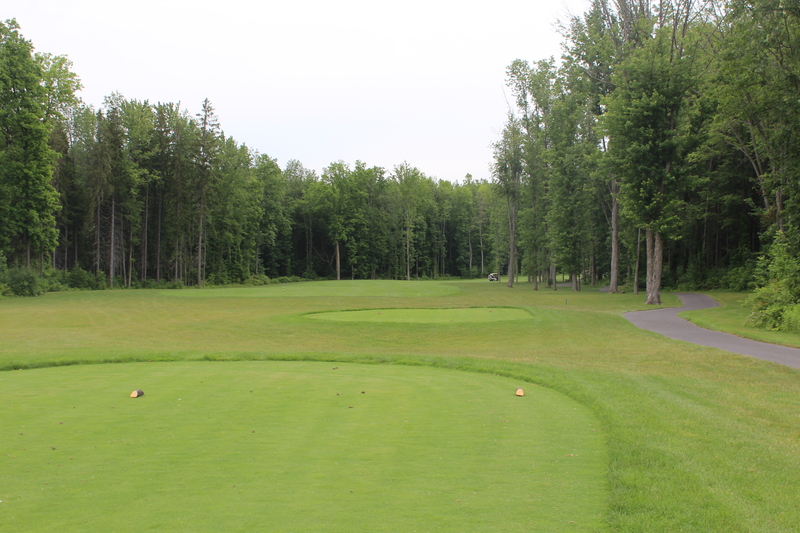 A nice fade with a 3 wood or hybrid is all you need here. 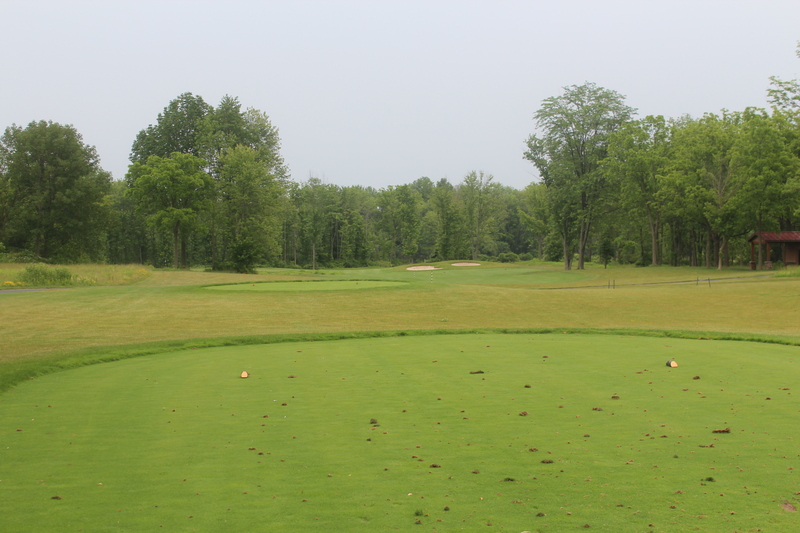 Below is the short, 100 yard approach into the green. Only trouble is the bunker in front. Trying to cut the corner paid off with a good angle to the right pin placement. Unfortunately, I three putted for bogey. I couldn’t really capture it in my pictures, but the greens here are very undulating and punish you severely if you don’t land on the correct tier. This a pretty straightforward, shorter par 3 from the White tees. However, from the tips it plays at a long 226 yards. It drops off on the back and left and there’s bunkers on the right, so your only place to miss is short right. The 5th is the #1 handicap hole, but I’m not really sure why. It’s not very long and there’s not a lot of trouble, especially from the tee. 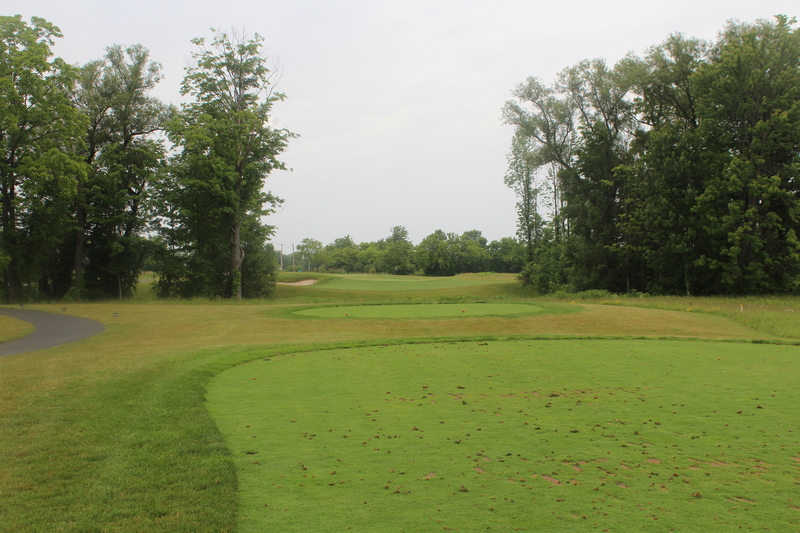 Take aim at the big tree in the middle of the fairway, with a little draw for the best line on this slight dogleg left. The approach here is where the trouble comes into play, but as long as you avoid the bunkers, it’s not a tough green and is where I got my 2nd and last birdie of the day. The 6th is another slight dogleg left, shorter par 4. Driver isn’t necessary and a little draw is your best bet. I didn’t get a pic of the approach, but the bunker just in front of the green, which can be seen from the tee above, can be a little intimidating to hit over. 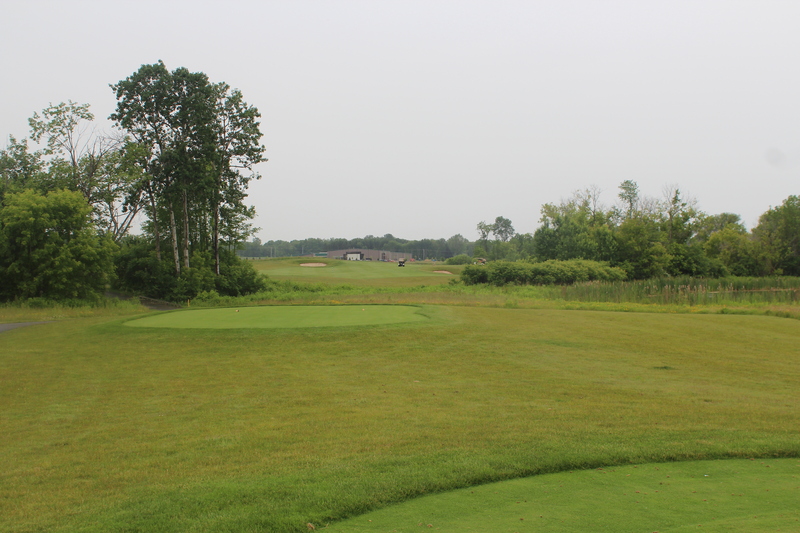 The 7th is a medium length, slight dogleg right par 5, which is reachable with two good shots. The drive should go right over the bunker in the middle of the fairway. It’s only a 190 yard carry, so it’s not really in play. 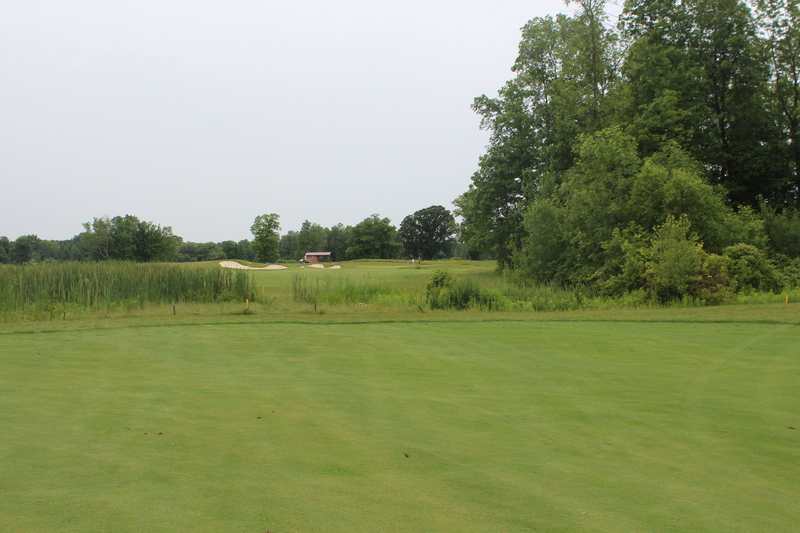 The second shot features another carry over a marsh area that’s not in play. Make sure not to go right, because there’s a lot of water over there. 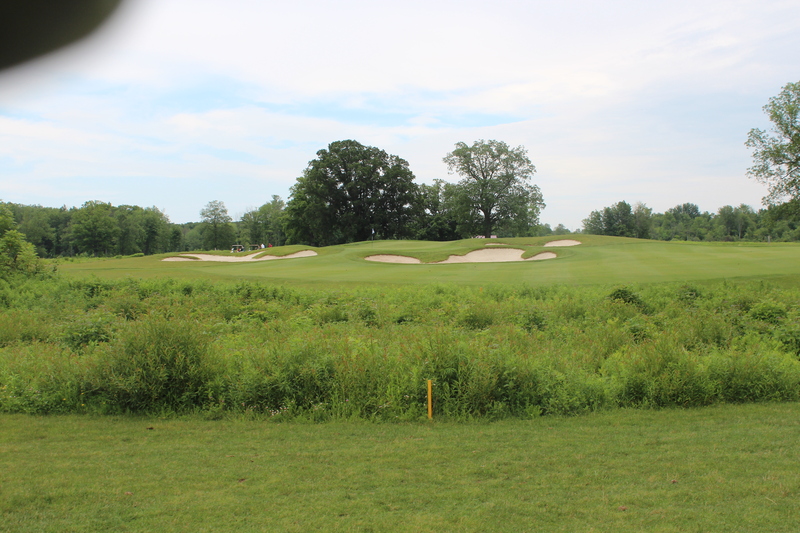 This is a very difficult hole with a severely tiered and undulating green, not to mention the large bunker to catch errant shots to the right. Hitting the green here does not guarantee par. Couldn’t really capture how tricky this green is in the picture, but here’s a closer look. This is a very difficult, long par 4 and was where my round started to unravel. If you have trouble hitting a draw with your driver, like I do, this hole does not set up well for your eye. 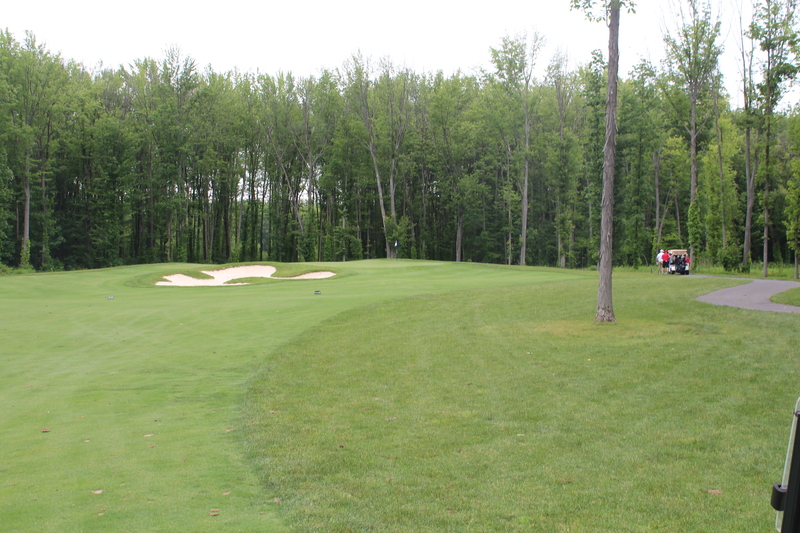 Most people will have to hit to the right of the bunker complex as it is a 250 yard carry off the tee. I didn’t get a picture of the approach, since I didn’t exactly have a traditional one, but I did take a picture of another crazy green on this hole. When you make the turn, you’re greeted with fun, short par 4. Despite the short yardage, it’s pretty hard to drive the green here with it being uphill the whole way. 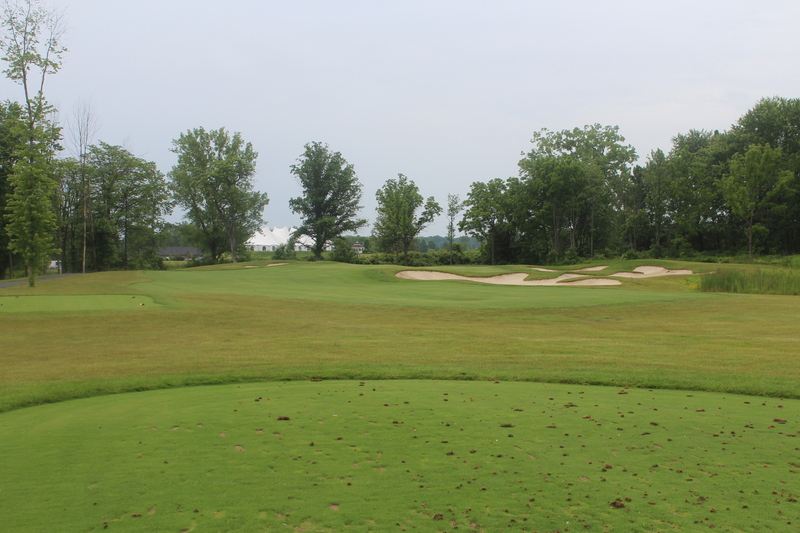 The fairway bunkers are definitely in play, if laying up off the tee, and there’s water down the right side. 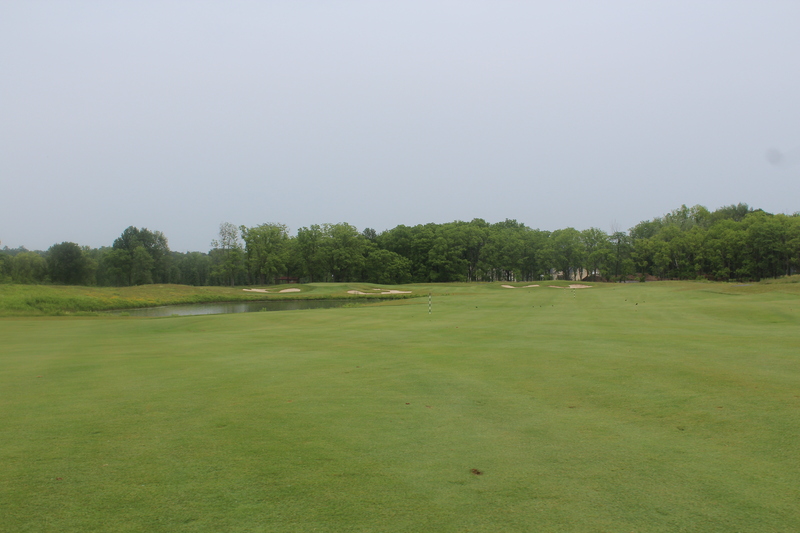 Below is the short approach into the green from a little over 100 yards, which I proceeded to thin my 52 degree wedge and end up with a double on one of the easiest holes. As you’ll see from me forgetting to take pictures on some of the holes, the back 9 did not go so well for me. The 11th is a long, 3 shot par 5 for most people. 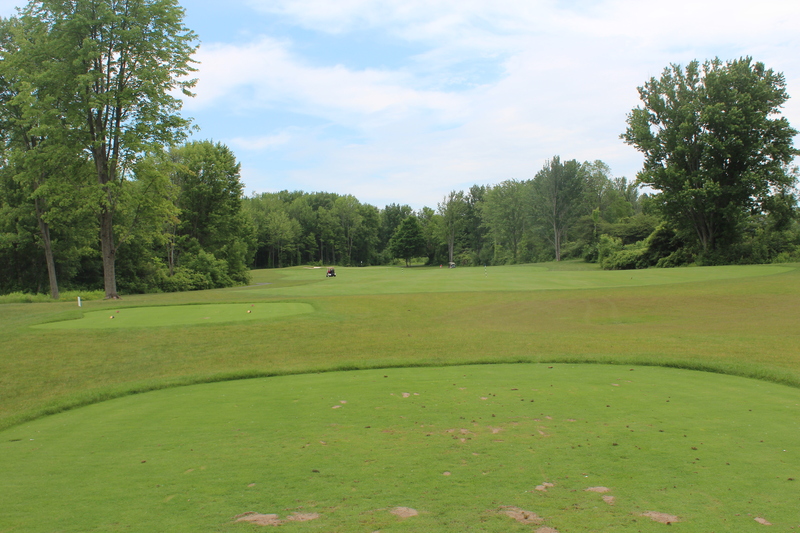 Even from the white tees, you’ll need a good 280 yard drive to be able to even think about going for it. The safe play off the tee is to the right of the bunkers as they require a 230 yard carry to get over them. 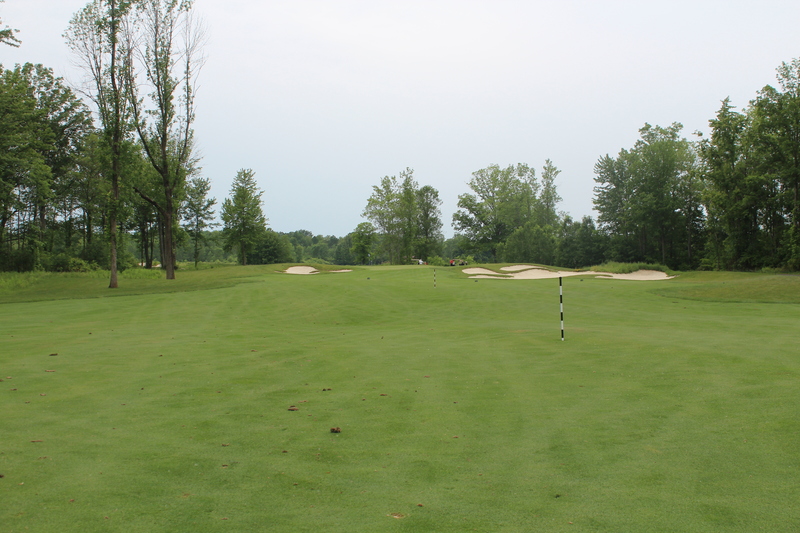 The second shot requires you to carry the bunkers in front of you for a short approach into the green. 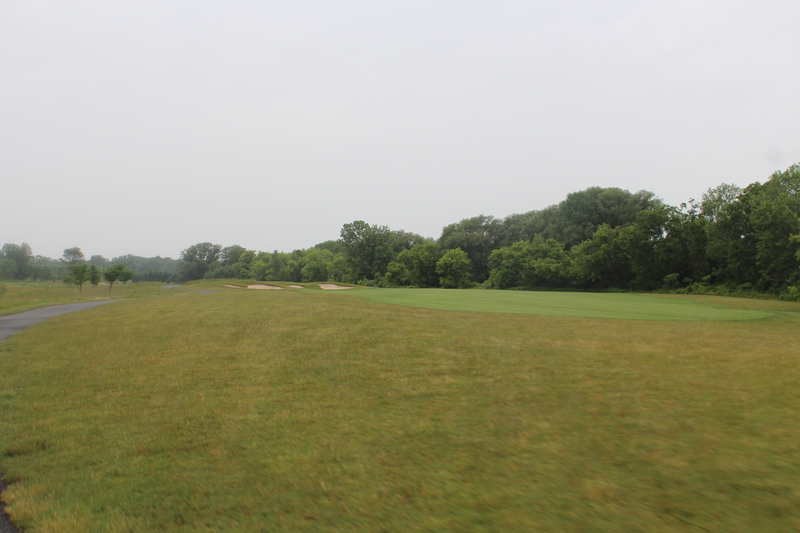 Here we have a shorter par 4 that runs adjacent to the highway. I had someone honk in the middle of my backswing and my friend informed me that it’s a very common occurrence, which I found a little annoying. Luckily, I still pured it down the middle. You definitely don’t need driver on this hole. It’s a much better idea to hit 3 wood to shoot the gap and make sure you don’t go left on to the road. There’s also a large fairway bunker awaiting errant shots to the right. The 13th is a straightforward one shotter that plays a little uphill and requires a mid-short iron. 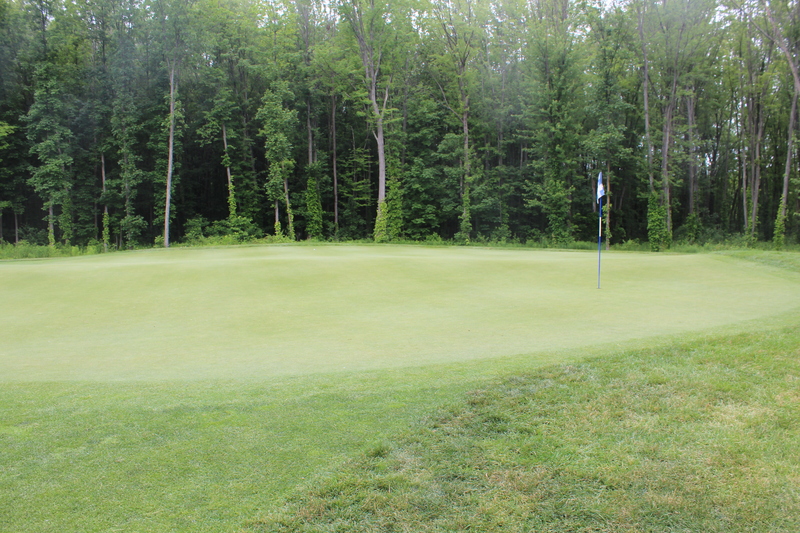 It’s definitely one of the easier holes on the course and a good birdie opportunity with a front pin location. The only trouble is the bunker on the left. This is a long par 5, which is the most difficult hole on the course, in my opinion. A good drive down the middle doesn’t guarantee par on this hole. You’re still left with a lot of hole and a lot of trouble. 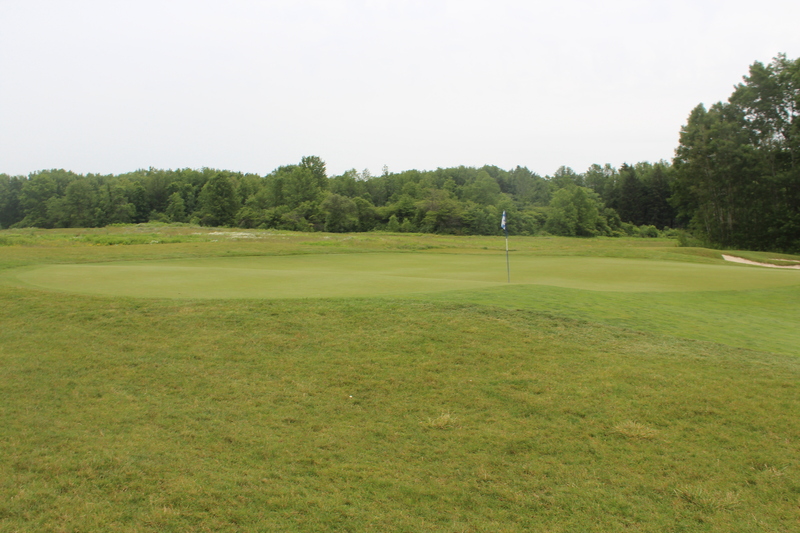 You’ll have to have a lot of guts and a lot of power to go for this green in two. 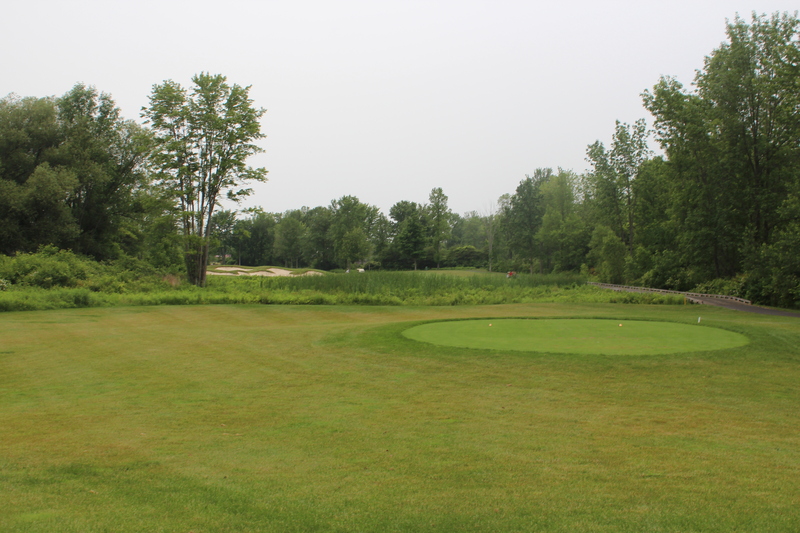 It requires a long carry over water to an elevated green. The layup is to the right. Just aim at the bunkers and take a club that puts you short of them and at a distance that puts you at a good yardage for your third. 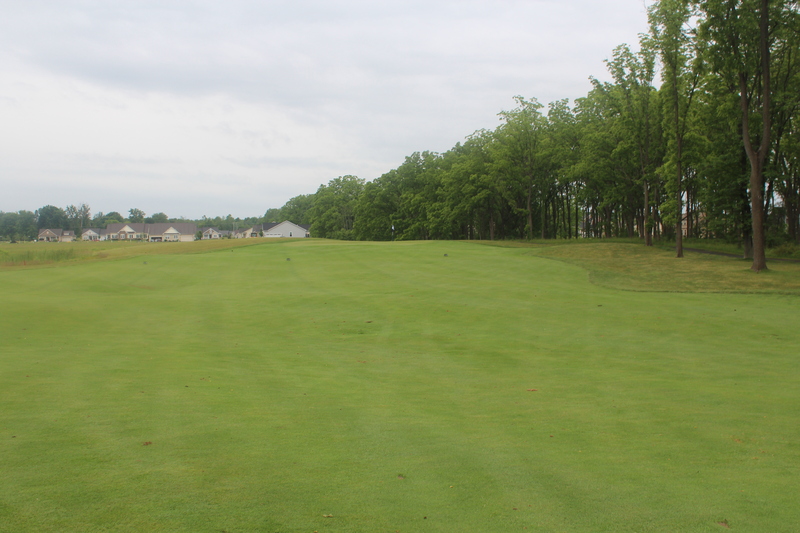 Below is the 100 yard approach into the multi-tiered, severely undulating green. The 15th is a short dogleg left. Short par 4s are usually my favorite holes because of the risk/reward aspect of them, but this one is all risk. There’s very little opportunity for reward and it would require a perfectly played, big draw over a hazard. Just poke out a long a iron short of the bunkers and wedge to the green. 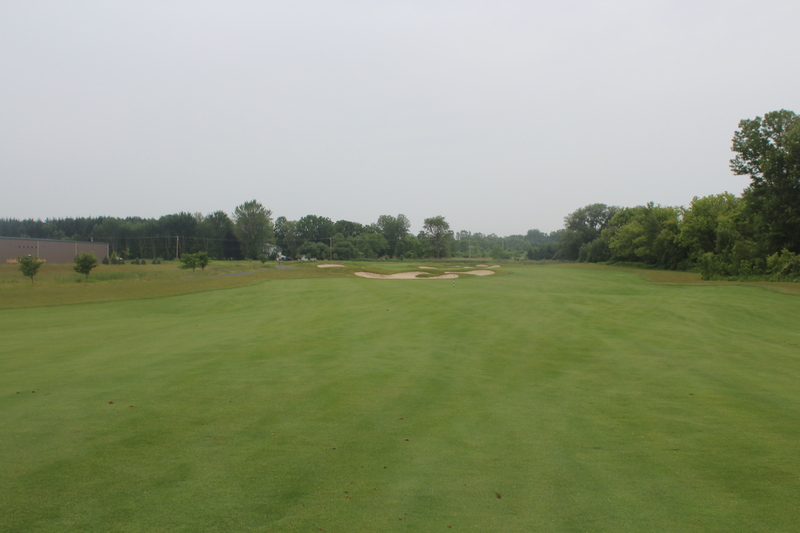 Below is the short approach after hitting a 6 iron off the tee. Don’t be deceived by the yardage on the last par 3 here. A HUGE bunker will swallow up shots short and right and there’s no bail out the left as another bunker is there as well. 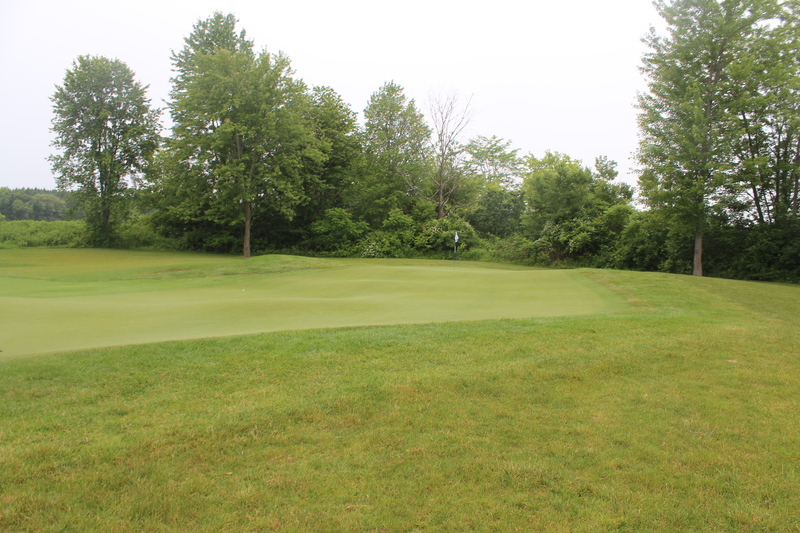 The green is large as well and just hitting it doesn’t guarantee a two putt. Now this is a fun hole. I didn’t play it well, but I liked the idea of it and I’m very disappointed I forgot to get a picture off the tee. There’s a line of bunkers that cross the fairway that you’ll have to carry in order to have a short approach into the green. The furthest on the left requires a 245 yard carry and to play short of the bunkers, you can only hit a 180ish yard shot. Below is the approach after carrying the bunkers. 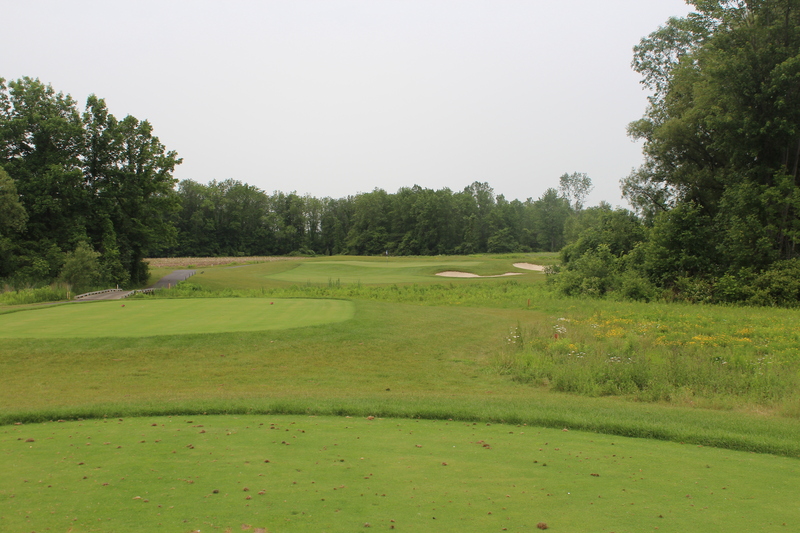 The home hole at Timber Banks is a test. You’ll need two good, long shots for a shot at par here. There’s a hazard left and a bunker right on the tee and your approach will have to carry the hazard on the left. Below is a shot of the approach. 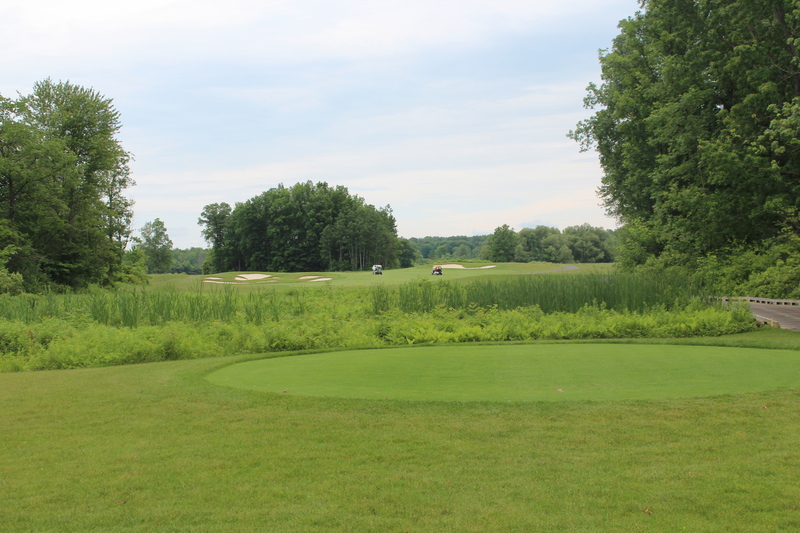 There’s no denying that Timber Banks is a nice course, and probably the best course in the area, but it didn’t wow me by any means. It was well manicured, but I really wasn’t a fan of the design. Nicklaus’ designs are interesting. They’re either fantastic or like this one, they just seem very contrived and more like a template design, rather than something unique. The holes just seemed to blend together. There was nothing really visually interesting and only a couple of fun holes. I guess I’m also a little salty that I didn’t break 80! It’s definitely worth it to play here, especially with the twilight rate, because of the groundskeeping and to play a Nicklaus course if you haven’t before, just don’t expect anything too special. Next stop, the classic Donald Ross design that has hosted 3 U.S. Opens, 3 PGA Championships, 2 U.S. 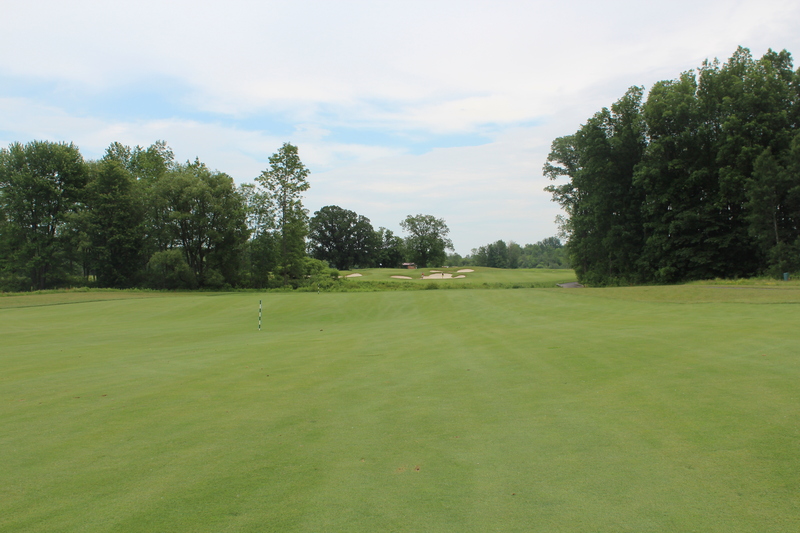 Amateurs, and a Ryder Cup…Oak Hill Country Club! And the weather in Columbus isn’t looking great. I’m most likely not going to be able to play any golf while I’m there, so that unfortunately means no Longaberger. I was really looking forward to that, so it’s pretty disappointing. 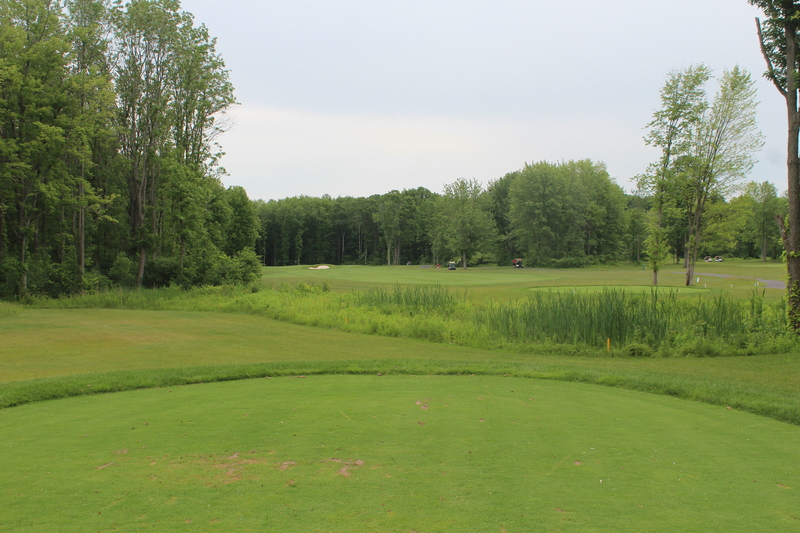 However, I spent the night in Syracuse at my buddy Kris’ house, since I had a 6 AM flight today and live 2.5 hours from the airport, and we got out and played Timber Banks Golf Club yesterday. It’s a nice Jack Nicklaus track and I enjoyed it quite a bit. I’ll be posting a full write up with a bunch of photos tonight or tomorrow, so keep an eye out for that! I’ve been pretty busy at work and haven’t gotten much time to work on the site, but I have some very awesome news to share. I’ve lined up two Top 100 Courses and I’m now officially beginning my quest to play the Golf Digest Top 100. I’ll be playing at Oak Hill Country Club towards the end of August and Dallas National Golf Club in the middle of September and I couldn’t be more excited. 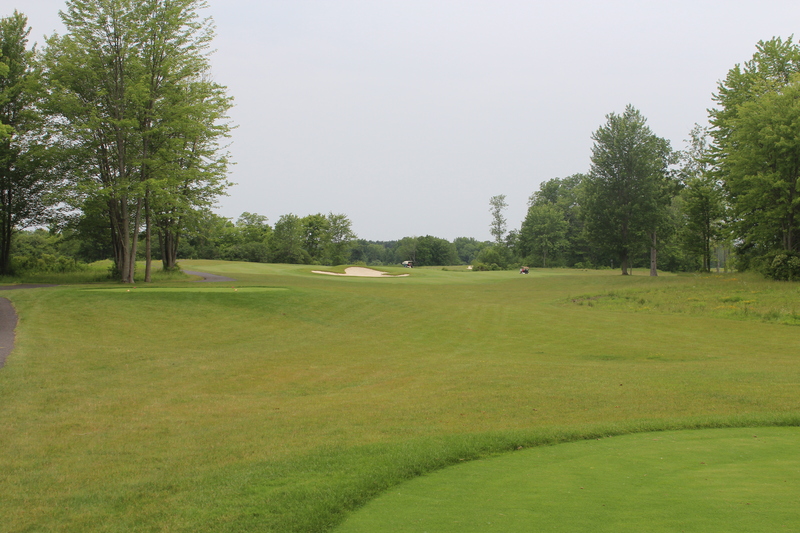 I’ll also be playing Longaberger Golf Club, a Top 100 Public track in Columbus, Ohio, next week, so look for my write up on that coming very soon! 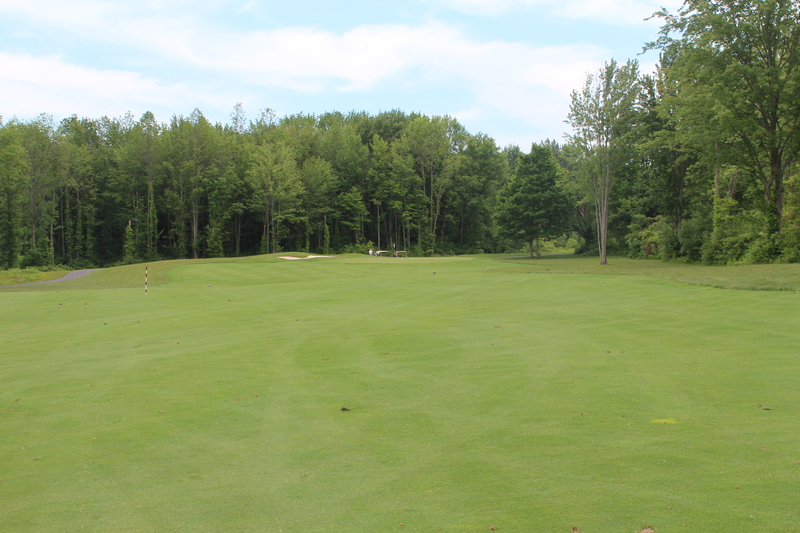 Well, I got to play a few times when I was in Myrtle Beach a couple of weeks ago, but I’m finally going out up here in northern NY tomorrow morning for the first time this year. So, I figured I’d post my WITB. So obviously, I still have some updating to do, first of which would be a new driver. I just can’t seem to find anything that I’m as confident and consistent with. I’ll be trying out the new products in a couple weeks and hopefully I’ll be able to find something then. My RBZ 3 wood is my first TaylorMade club I’ve ever had. I’ve always been a Callaway guy, but I hit that a couple times and fell in love. That thing is crazy long. The hybrid has become my go to club. I had trouble hitting hybrids for awhile, but this one is so easy to hit and the way it looks at address just makes me confident that I’ll make a good shot. After my driver, irons are next on the upgrade list. I’ve had the same problem with them as my driver. I can hit a nice little draw with every shot. The problem is, I hit a nice little draw on every shot. It’s very hard to work the ball with them, especially left to right. Every iron I’ve tried to replace them with, that has a little more wokability, is less forgiving and I hit more bad shots than I do with my current ones. I need to find an iron with the perfect balance. Wedges need an upgrade too, but not as immediately. They’re nice, but they’re no Vokeys. My putter is my favorite club in my bag. It rolls better than any putter I’ve ever tried, including Scottys. Well, the Scottys roll just as well, but the #9 suits my eye better. And there it is. My WITB for the year. I’ll update with reviews of clubs I try and obviously my additions to my bag. Here’s hoping they have a good year! Well, I hate to say I told you so, but…just kidding, I love to say I told you so. I said that Spieth would defy history and win the Masters and as you all know, he did. That means I’m either psychic, the best golf analyst of all time, or Jordan Spieth is just really really good. I don’t even know what’s going to happen tomorrow and I also thought Anthony Kim was going to be the next Tiger, so I’m going to go with the latter. To start, here’s an interesting stat that I came across: Spieth ranked 52nd in Driving Distance out of the 55 that made the cut, thus proving my theory that I stated on Thursday night that being long isn’t a pre-requisite for winning at Augusta. The intricacies of Augusta highly outweigh the necessity for power. It undoubtedly helps, but is in now way the primary factor. Spieth’s multiple record-breaking performance was well-deserved and utterly fantastic, but was not the best ever. Tiger’s performance in 1997 is certainly still the best ever and I’d say Nicklaus’ in ’65 and arguably even Raymond Floyd’s wire to wire in ’76 were better than Spieth’s. Augusta was setup to play quite easier than usual this year. Greens were soft and responsive. If you hit a good shot, you were rewarded, rather than practically holing out and having the ball careen 20 yards off the green and balls staying up on ledges that they never do. Let’s also not forget that Tiger won by 12 strokes, while Spieth only won by 4. Nicklaus won by 9 with Arnie and Player in second and Floyd won by 8. Another thing that annoyed me was Spieth not holing his putt to break the record for the lowest Masters score ever. I can’t even remember a time Tiger or Jack missed a makeable putt to win a major tournament. I’m sure they did, but it always seemed like they would put them away so they didn’t have to tap in to win. It might sound nit-picky, but I think it’s necessary when you want to compare someone to the bests ever. Let’s talk about comparing Spieth to Tiger and where Rory fits in now. The similarities are certainly there for Jordan in those statistics we’ve all seen of their first 6 rounds at The Masters and their age and whatnot, but it goes further than that. He’s a grinder. There were many times in the 3rd and 4th rounds where I was watching and said to myself “Uh-oh, here’s where he’s going to mess up and fall back a bit.” But he never did. He’d hit a poor shot and then pull off a great recovery in the same fashion we’ve seen from Tiger an uncountable amount of times. Now, when Rory came onto the scene we were calling him the next Tiger too, but I’d say he’s more of the next Phil. He’s unbeatable when he’s on his game, but when he doesn’t have it that week, he’s not going to win. Tiger has made his living more out of winning when he shouldn’t have than dominating, which he’s done his fair share of too. So, is Spieth the next Tiger? No. What I’ve learned from trying to figure out who is going to be the next Tiger over and over again for these past few years is that I don’t think there will be another Tiger for a long time, if ever. Tiger already brought golf to the mainstream and Spieth is nowhere near the the personality that Tiger was, but he’s as close as we’re going to get for now. We saw a much more human-like Jordan Spieth today, which leaves the door open for a possible come from behind victory from Phil, Rose, or Hoffman, but it’s not going to happen. Spieth had 3 bogeys and a double today (his first of the tournamnet), but he also birdied 4 of his last 7 holes. Sure, he’s been in the final group before and lost, but he’s also been in the final group before and lost. He already has that experience under his belt and plenty of winning experience since. He hasn’t shown any sign of a potential mental hiccup (he’s parred every hole after a bogey and birdied the next hole after his double). If he was playing with Phil, I might say he could have a hint of intimidation heading into Sunday, but with no disrespect to Justin Rose, he’s no Phil. Everyone knows that you can’t win a tournament on Thursday, but with the way Spieth played today, it’s hard to believe that Bubba won’t be slipping that green jacket around his shoulders on Sunday. It sounds crazy that I have to justify why he’ll win given his fantastic performance today on his way to an almost record-breaking score of 64, but history says he won’t. In the past 30 years the first round leader has only won the tournament once, which was Trevor Immelman in 2008. It’s true that being long certainly helps at all courses, so it obviously makes Augusta somewhat easier, but it’s not a necessity. There are many recent Masters winners that have been in the middle of the pack in driving distance. In 2007, Zach Johnson won with only being longer than 3 other players. He averaged 265 yards! I can do that! You also can’t ignore his form coming into the tournament. Win, second, second in his last 3. With golf being such a mental sport, you have to believe he’s incredibly confident in his game right now, which only breeds success. While history dictates that you can’t be leading after the first round, you also have to be in the top 10. While Els, Hoffman, Day, Rose, and Garcia all looked impressive today, there’s just something intangible about Spieth that makes me think he has what it takes to finish the job this year. Maybe it’s his Tiger-like confidence at such a young age. Oh, that reminds me. Who was the last winner that wasn’t in the top 10 after the first round? Tiger. Just something to think about.